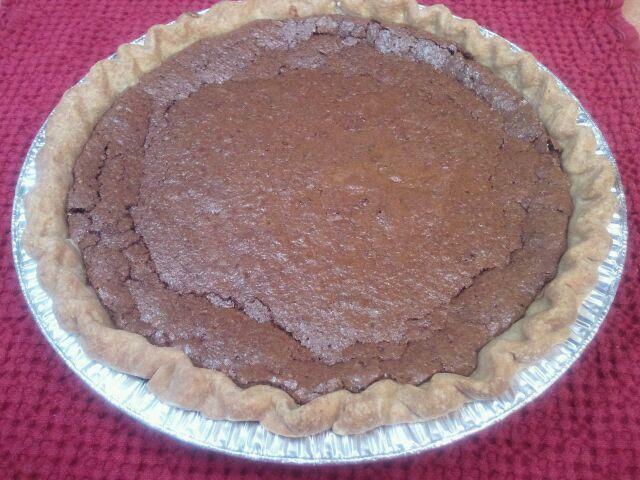 About a week ago I mentioned that I was looking for new pies to make and had found a recipe for Chess Pie. It’s a custard-like pie that has one unusual ingredient: cornmeal. There are many stories about where this name might have come from that you can read here. Melt the butter & chocolate gently. Combine dry ingredients. Whisk in eggs, egg yolk, cream & vanilla. Whisk in the chocolate mixture. Pour into cooled pie crust. Bake 55-65 minutes at 325F, turning in the middle to bake evenly. It’s done when it’s formed a thin, crisp top crust and barely jiggles when shaken. Cool at least 90 minutes. Today I made this recipe and it is incredibly easy to make and this is what it looked like when it came from the oven. It sort of looks like a Brownie Pie doesn’t it? It has the same kind of texture on top – which sounds like a slight crunch when you touch it… and it smelled divine. But I couldn’t leave it alone… I wanted to spruce it up a bit more. 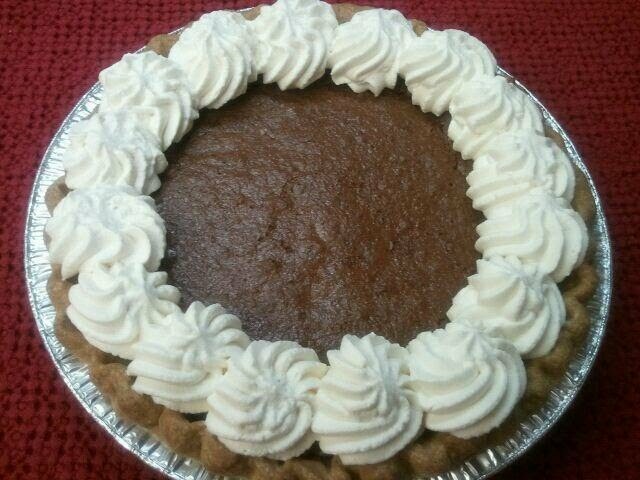 So, I made whipped cream and piped it around the edge because I still wanted to show off the top of the pie. Then I decided it needed one more touch…. shaved chocolate…. … there! Now it was ready for delivery! Yesterday afternoon my daughter Alexandra suggested a name for a pie. The lady that she suggested is the mother of one of my daughter’s best friends and her name is JoAnn. We’ve known each other for about ten years and while I haven’t seen her in a while, I always think of her fondly. Each time I see her I am impressed by her gracefulness and her sense of humor. 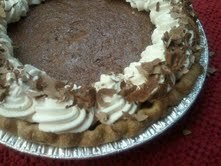 Tonight Alex and I called upon JoAnn and presented her with this Chocolate Chess Pie. She thanked me for the pie and invited us in for a visit. We spent an hour or two catching up and before we knew it, it was time to leave. Then we gave hugs all around and we were on our way. And it occurs to me now that I did not share these thoughts with JoAnn – and I should do that now. I want to recognize JoAnn for being a remarkable mother to two fine sons and for being a friend and confidante to Alexandra. I would also like to thank JoAnn (and Facebook) for helping our kids stay connected, even though they live 3,000 miles apart. 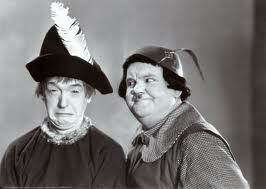 Our lives our fuller (and funnier) because of their friendship. Several times this week I found myself thinking about a lady named Esther from church, and that seemed enough of a reason to select her as today’s pie recipient. 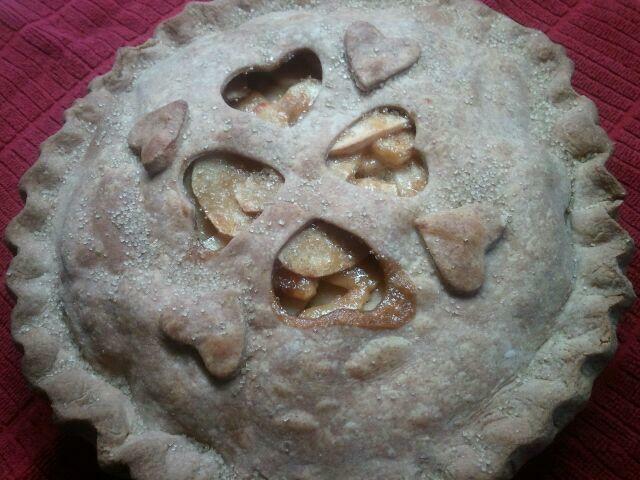 As I wasn’t sure what type of pie was her favorite, I decided to make a simple Apple Pie and used a heart shaped cookie cutter to decorate the top crust. That little touch made such a difference to me… and Esther seemed to appreciate the added touch as well. In yesterday’s post I mentioned that I had found a recipe for Chess Pie and I asked if anyone had ever made it… and what they thought of it. This afternoon I received several emails about this pie, and a man named David sent me a recipe for Chocolate Chess Pie. I’ll share the recipe when I make it… because I will definitely be making this pie this week. Tonight we are happy that our daughter has arrived home safely from her vacation to Copenhagen. She is exhausted from a trip that took about 24 hours, but she had a wonderful time and is looking forward to starting her next to last term at Southern Oregon University tomorrow. Tonight as I make my way to bed I thought I would leave you with a short clip of my favorite comedy duo, Laurel and Hardy, dancing and synched to the music of Santana. Click on the link below and enjoy. Sweet dreams.